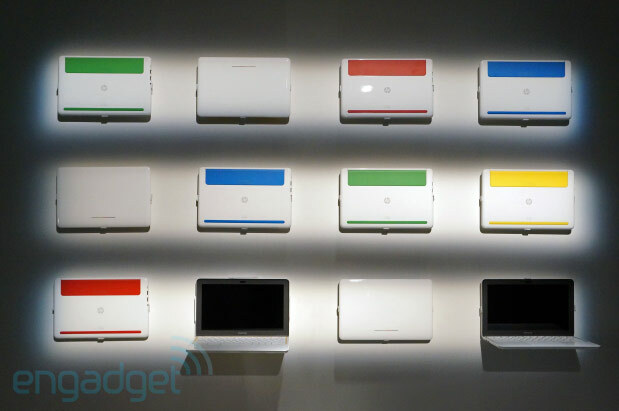 A few days ago, a leak tipped us off to an unannounced HP Chromebook 11, and today Google made that piece of hardware official. Priced at $279, this 11-incher is available today, and we've already had a chance to get our hands on the unit -- in several of its punchy color options, to boot. The design is completely screw-free, leaving the lid and back bare. Incidentally, the machine is also void of vents or fans -- with the Sasmung Exynos 5250 processor under the hood, hopefully things won't get too toasty. That processing unit is accompanied by 2GB of RAM, and a 16GB SSD is the sole storage option. As for WiFi, we're looking at dual-band 802.11 a/b/g/n (with Bluetooth 4.0) though a rep said a 4G option will be available as well. A few interesting changes this time around: HP moved the digitally tuned speakers below the chiclet keyboard, which allows for "sound that rises up toward you." The Chromebook 11 also charges via micro-USB, which means you'll likely have the power cord you need on you at all times. Speaking of connections, you'll find two USB 2.0 ports on the left side of the machine, along with a headphone jack and SlimPort video out, while the right side is completely clean. Google said the HP Chromebook Pro 11 was inspired by the Pixel, but don't expect that notebook's pixel density here. The 11.6-inch IPS panel sports a 1,366 x 768 resolution-- but colors look bright and viewing angles are impressive. You'll find the full-size Chromebook keyboard on HP's machine, along with a clickable touchpad and a VGA webcam above the screen. Based on our hands-on time, the island-style layout is quite comfortable, and it sports the enlarged Ctrl and Alt keys we've come to expect on Chrome OS machines. We're partial to the white version of the device, which sports one of four color accents around the keyboard, lid and backside, though a Piano Black option is available as well. It's also worth noting that the $279 price includes 100GB of Google Drive storage free for two years, along with a 60-day trial of Google Play Music All Access and 12 free GoGo passes. Google says you can expect about six hours of battery life on a charge, though we'll have to see for ourselves. Luckily, we'll be able to do that quite soon, as the company says we'll be walking out the door with a unit of our own.